It's July which means it is time for Skirting the Issue with Simple Simon & Co. Last year, I shared my Simple One Seam Skirt Tutorial with you so you can create a basic girl's skirt using a single cut of fabric. This skirt is one of my favorites to sew, and since we donated all but one of the skirts I made last year, Ella has requested a few new ones. 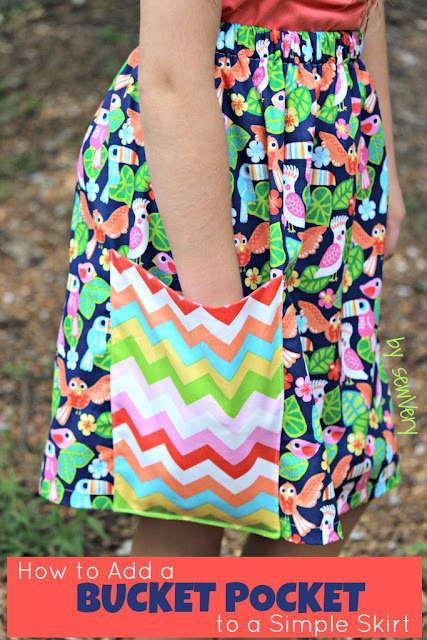 While my original skirt tutorial does not include pockets, I'm sharing another fun and simple tutorial this year that shows you how to sew a Bucket Pocket to my Simple One Seam Skirt. You can use this pocket tutorial and add it to any other basic skirt or pair of shorts, too.